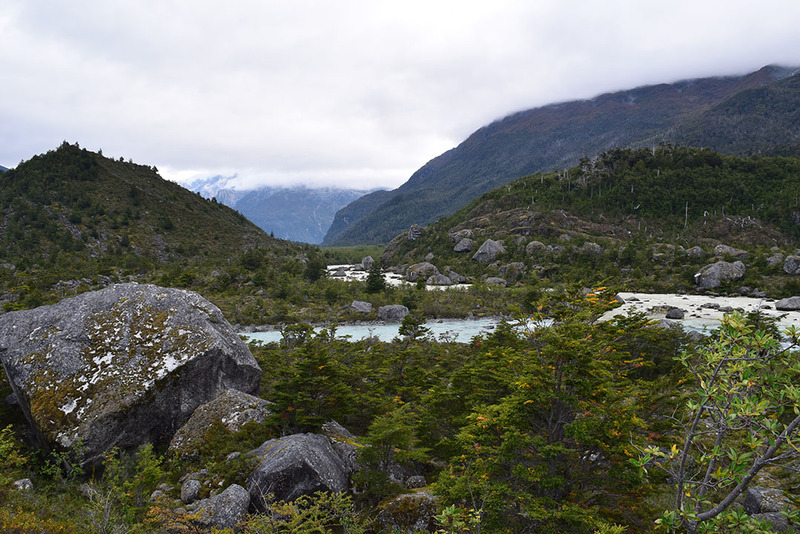 At one side of the Carretera Austral (Austral Road) we came across something tempting, a sign at the beginning of a path that leads to the Leones Valley and the Leones Glacier; gateway to the North Ice Field. The sign also warns us that the next 17 kilometers to the beginning of the walking route are only suitable for 4×4 vehicules, but, will it be true? 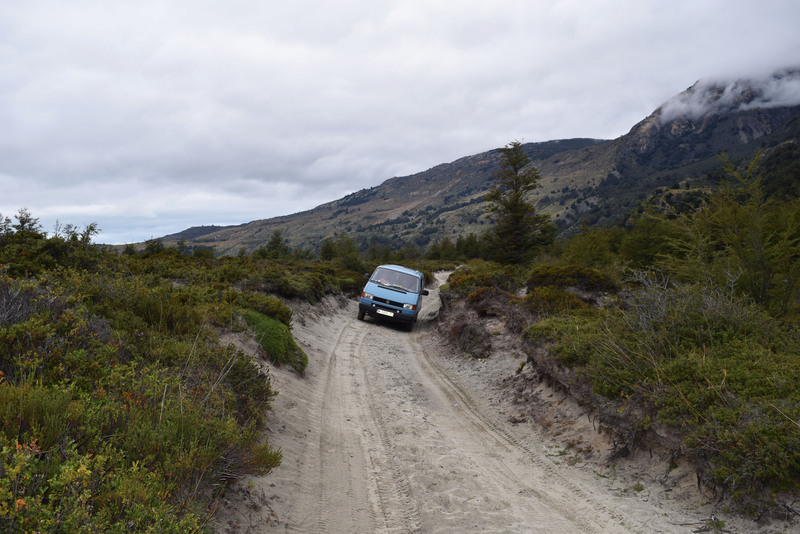 The streams, muddy areas, stones and the several kilometers stretch formed by beach sand that we don´t know how it came here, are the funny part that amuse this road that goes mostly through privates lands. The owner of one of this lands allows us to spend the night by the river to the next morning begin the 18 km hike round trip. There is also the possibility of leaving the van at the end of the road, pick a tent and the sleeping bag, walk a bit and overnight once the road for vehicle ends. 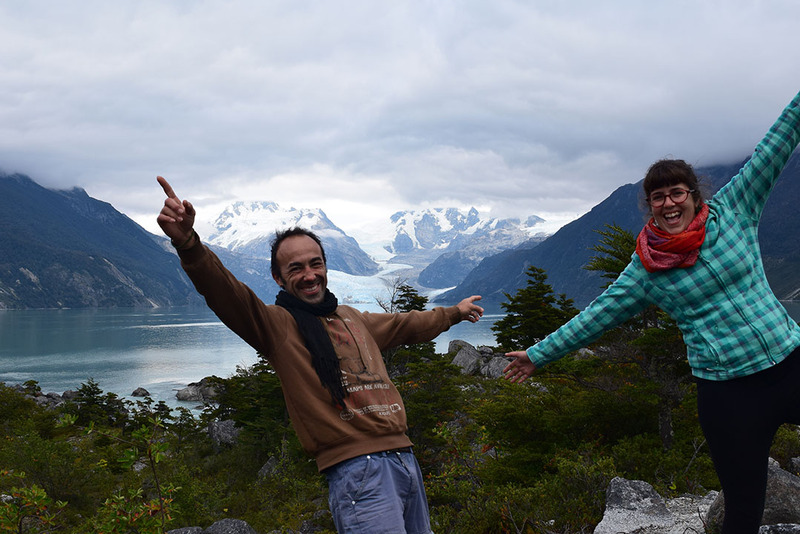 For us, the Leones Glacier is impressive, amazing and beautiful. 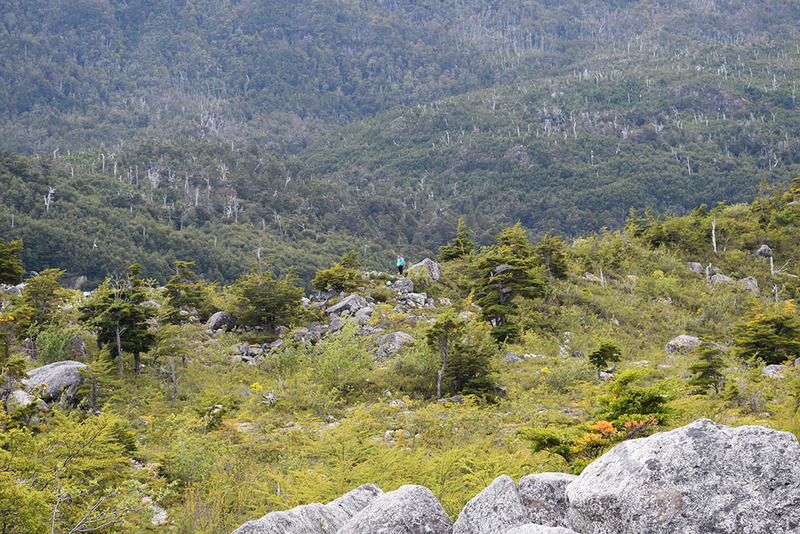 It is quite possibly you see nobody along the whole hike. The 18 km path is well marked, and it is only slightly hindered during the ascent and descent of a small slope that borders a cornice overlooking the Leones River. 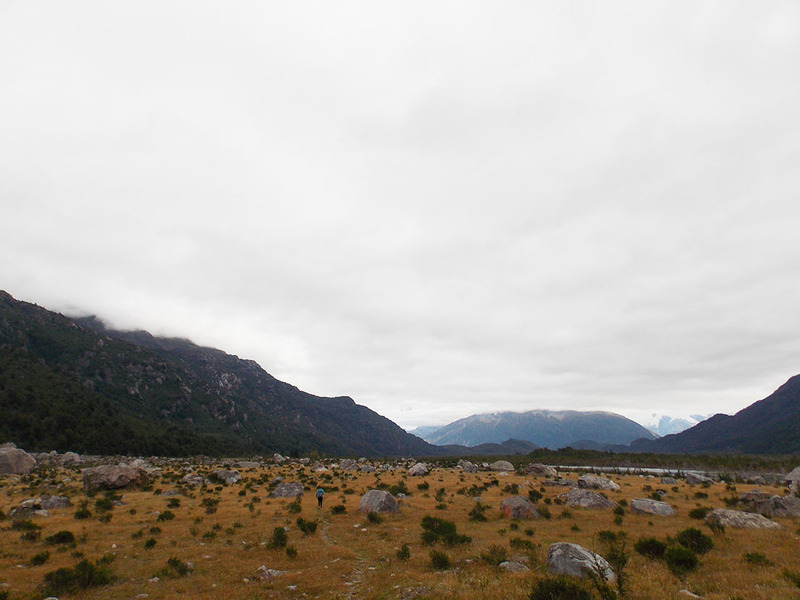 Soon after starting the hike you cross a wide field with huge stones scattered throughout the territory, creating an unusual landscape resulting from an avalanche of the Mapuche Glacier. 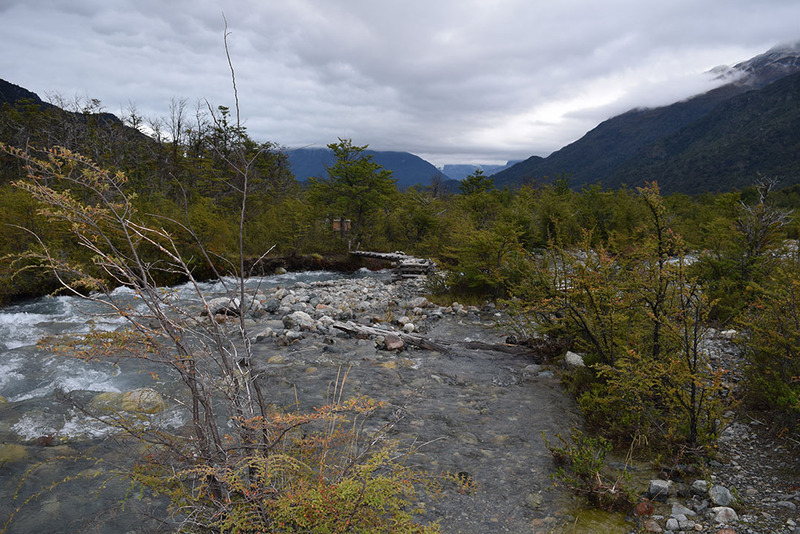 Shortly afterwards we have to cross the Mapuche river by a bridge of planks, and then the trail begins to narrow in a forest that shelters species typical of the area, such as ñirre, lenga, canelo, or coigüe. The silence of nature follows you all the way. This valley is a well kept secret. Up to here the path is flat, and flat begins again when passing the steep slope where we find wooden stairs and ropes that make the advance easier. Coming closer to the end the forest vanish omletly, leaving you to walk in and open field with just a few trees and some bushes, where you can see the tracks of foxes that live in peace in this corner of the earth. 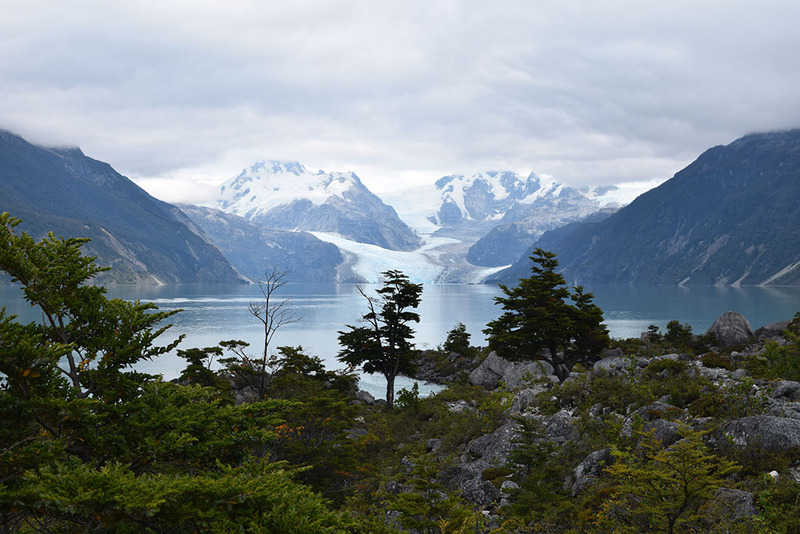 The ascent through a moraine raises the curtain to reveal the final show; Leones Lake at our feet and in the background, coming from the North Ice Field, the Glaciers that gives birth to the lake, Leones Glacier. Enjoy the way back from the same path. Appropriate time: Between December and March, during the summer season. In summer the temperatures are warmer and the days longer (in these latitudes in summer even after 9:00 PM there is enough light). 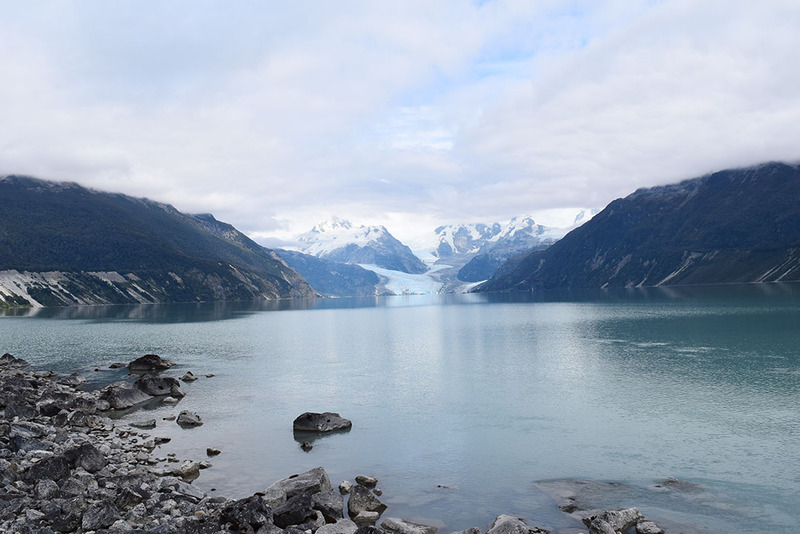 Have you visited Leones Glacier? Would you like to go?